With the YouCoachApp subscription you can keep your drills and training sessions in a safe place and access them at any time from any device. Subscribed users have access to selected e-Videos, Webinars and e-books available on YouCoach. More content is provided for free during the season. You will get instant access to much of this content right after the purchase of your subscription to YouCoachApp. If after the purchase you need help in getting started or you want to be sure you are taking full advantage from all the features of MyCoach, a tutor will help you to maximize your success, by explaining all the features and replying to your questions. YouCoachApp is a tool for everybody. With YouCoachApp it is possible to manage all the aspects of your sport season. 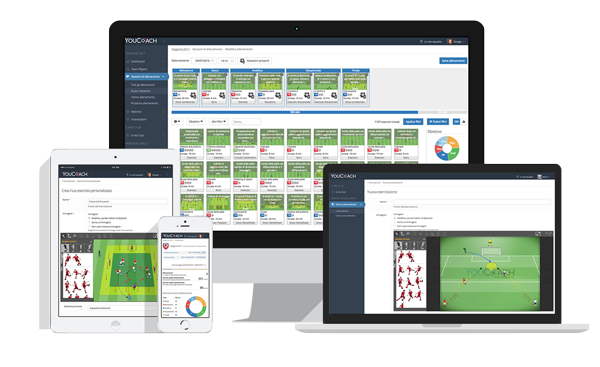 Through easy and quick to use features, you can manage training sessions, games, drills, staff members and players. Do you want to save your drills and use them during the creation of your sessions? Having access to a vast ready to use professional drills? Would you like to be able to design your drills with animations? Would you like to share with your players information and videos or get feedbacks from them? Or maybe you would like to simply save all the data about your games in a single safe place? YouCoachApp can do all of this for you. Manage your team and season from any device. Create your training sessions with the drag and drop. Enrich your private database with your own drills. With the drills editor you can choose between more than 600 figures of men, women and children and create animations of your drills to easily explain how they work. By just inserting the main information about your work, such as the players present at each training session and who will play each game, you will be able to get detailed statistics about the entire team and about each single player, to measure your progresses and monitor the effectiveness of your work. 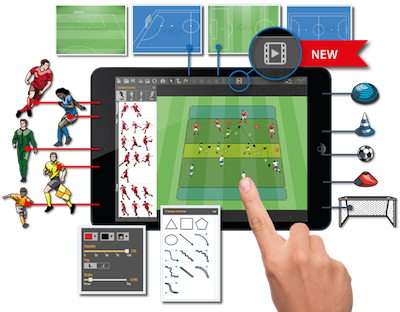 With the new graphic tool included in MyCoach you can use more than 600 figures of men, women, children, referees, goalkeepers and coaches to create effective images of your drills. By using arrows and geometrical shapes, by changing the field prospective and inserting the required materials, you can easily digitize your personal collection of drills and have it always available on line. All your data will be preserved forever and will be always at your disposal. With the new function "Animation" you can easily create animations of your drills. No download required and it works on any device such as smartphone, tablet and PC. Discover YouCoachApp in this video showing its main features: managing the season of your team will never be the same. Use the best tools for your job and keep all your data and information in a single place. Start watching this video to discover all the potentialities of YouCoachApp.